A couple people mentioned to me that they like to stop by Balewa's Vegan Gourmet to pick up the Ras Salad ($5.99) for a quick and easy meal. Make that two meals ... this salad is as filling as it is colorful. The base is salad greens topped with a trio of Balewa's raw specialties. One scoop is always the 14- karrot gold, a carrot salad, the other two vary. 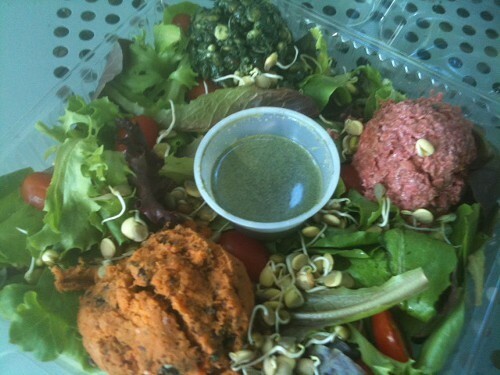 With this order, it came with a scoop of the famous live burger (the pink) and Phyre, a live-sprouts salad with spirulina. All of it is topped with a healthy handful of sprouts, which adds a nutty flavor. Just a note: Balewa's is now closed on Mondays. Cochon 555, which puts on a series of culinary events across the nation to promote heritage breed pigs, has been releasing details over the last month on this year's Heritage BBQ. Heritage BBQ debuted in Memphis last year over the Labor Day weekend. 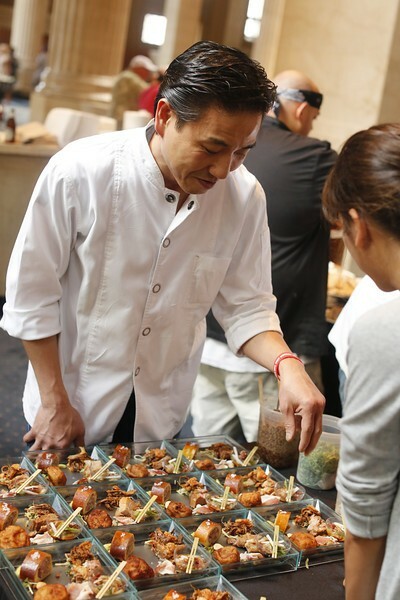 The three-day, multi-venue event included an outside "fire kitchen," a market, a pop-up barbecue restaurant, seminars, dinners, a run, and the main event — a competition pitting top chefs against each other in creating dishes using the whole hog. First, the event is expanding to Louisville and St. Louis. Second, what was once a three-day bacchanalia has been sharply focused into one event, the competition. 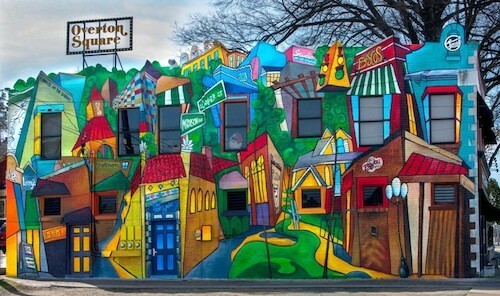 Here's some sweet news to report, local candy/sweets shop Sweet Noshings is set to open in Overton Square this fall. Loeb Properties issued a press release this morning with details on the lease for Sweet Noshings, which will be owned by Leena Asbridge. 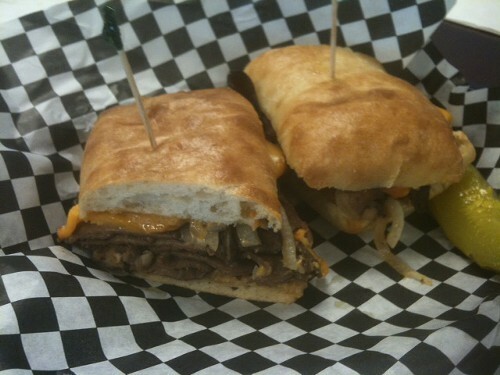 Sweet Noshings will be located in the building at 2113 Madison on the ground floor, near the Breakaway Running space. 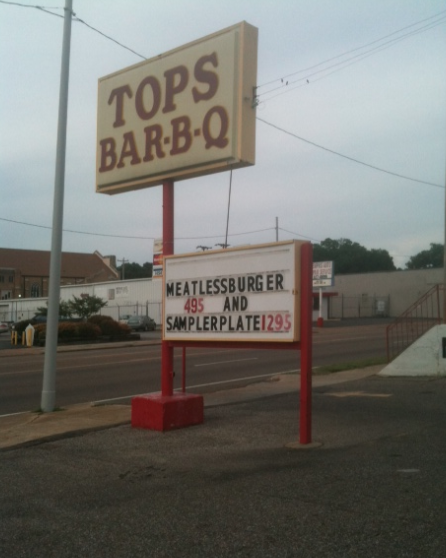 And I still didn't quite believe it as I held the messy and glorious Tops Bar-B-Q meatless burger ($4.95) in my hands. I may have to go get another one just to make sure. Fact-checking, you know. 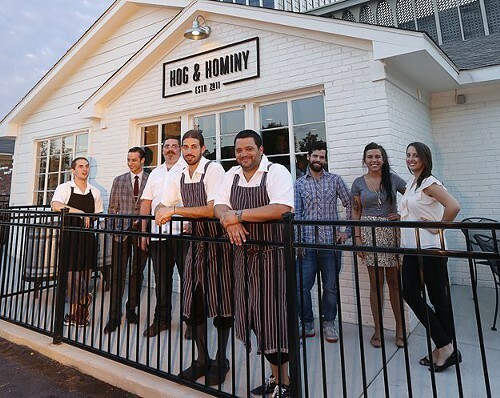 We've always said: If you don't gorge yourself at Hog and Hominy, you aren't doing it right. New York Times restaurant critic Pete Wells suggests the same in his recent review of this east Memphis hotspot. He experiences the joy of eating high on the hog in Memphis, with nary a dry-rubbed BBQ rib in sight. Wells piles on (and praises!) a selection of Hog and Hominy's eclectic, Southern-meets-Italian items: spicy fried sweetbreads, a beef and cheddar hotdog, and a piece of peanut butter pie. He even suggests that this younger sibling of Andrew Michael Italian Kitchen, Andy Ticer and Michael Hudman's first restaurant, has surpassed its older brother. I was helping myself to a slice — okay, several slices — of the Red Eye pizza the night the Times photographer came in to document this year-old golden child of Memphis' dining scene. I sidled up to Ticer, pointed to the cameraman set up in a corner of the restaurant, surrounded by so many perfectly plated wedges of pie, and asked who he was shooting for. "The New York Times," Ticer said softly. "A critic was in last week." Both Ticer and Hudman seemed too nervous to admit the review might be a good one. That night, the entire restaurant was tense with the knowledge that something important was happening, or perhaps wishing they'd worn a better outfit for the mystery cameraman's photo session. Now, with this glowing review behind them, the pair can breathe a little easier. But only for a moment. They've got a surge of business ahead of them, no doubt. Let's just hope there will still be room for us locals. If you've been to a corner store around these parts, then certainly you've seen Eric's Momma Homemade Butter Cookies. 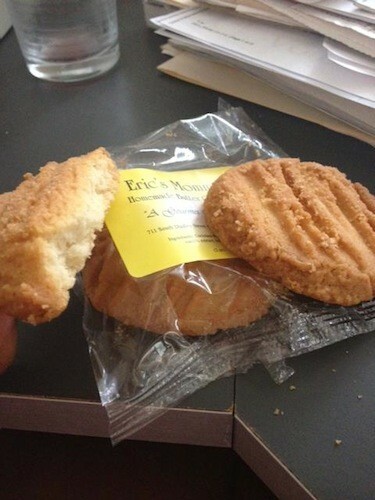 The "Eric" of Eric's Momma cookies is Eric Davis. He says his mother used to sell the cookies at church and sell so many that he decided to launch a business. Eric's mother, who has since passed away, wasn't interested in the venture, so Eric, using her recipe for butter cookies, started the company with a partner in 2006. "We started going store to store," says Davis, "and it took off." According to Davis, the company has a bakery in Midtown that employs three workers who make and package the cookies. They make roughly 1,500 to 2,000 cookies a day. Davis says that Eric's Momma has stuck to the corner stores because the difficulty in dealing with the multiple channels of larger, chain stores. "It's easier with mom-and-pops," Davis says. "You walk in the store, and chances are, you're talking to the owner right there." Still, Davis would like to expand Eric's Momma Homemade Butter Cookies into a nationwide brand, "something like Famous Amos," he says. You can find Eric's Momma cookies at Roxie's Grocery (520 N. Third), the Hop-in at Poplar and McLean, and many other locations. 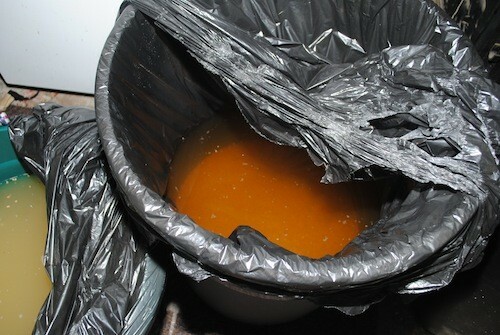 The Shelby County Sheriff's Department issued a press release on Saturday detailing the arrest of a Frayser man for "Possession of a Still and Transportation or Possession of more than three gallons of Unstamped Alcoholic Beverages," as well as other charges. From the release: "When questioned, Charles Materna admitted he was making liquor in a shop in the back of the residence. He then took detectives to a garage and showed an apparatus designed to produce and distill liquor." 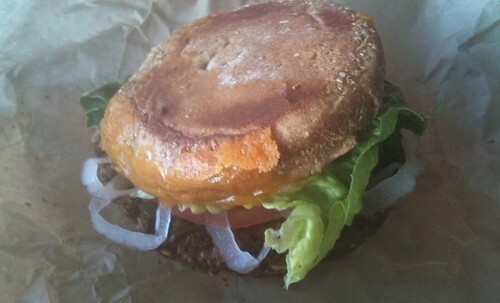 Whole Foods began offering Fuel Cafe's veggie burger several months ago. Customers can get patties ($2.99 each) from the prepared foods case to take home to cook or order a Fuel burger ($6.99) from the sandwich menu. As I am not so much as stirring a spoon in my kitchen these days, I went for the latter. 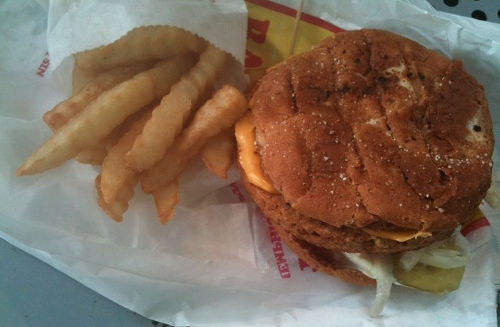 You get a choice of toppings — tomatoes, lettuce, onions, mustard, mayo (vegan available) ... nothing fancy. The burger is placed into the pizza oven for a minute or so to cook and returned for another minute to toast with the bun and cheese. The result may not be the best-looking thing out there, but it was really satisfying. 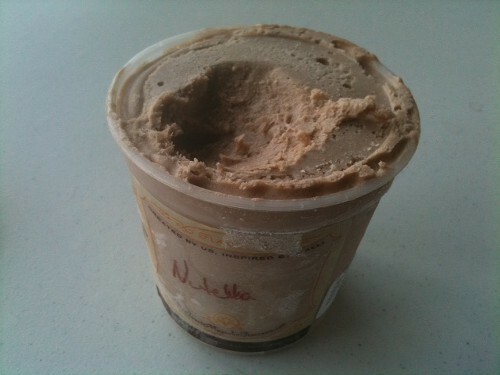 The thing about the Nutella ice cream made by the Clarksdale, MS-based Sweet Magnolia is that it doesn't taste overwhelmingly Nutella-y. What it most brought to mind was a chocolate malted, which is A-okay by me. Sweet Magnolia Ice Creams, in flavors from French Vanilla to pound cake and salted caramels, etc., are available locally at Miss Cordelia's, High Point Grocery, and Square Beans. A pint at Miss Cordelia's costs $7.99. Nine times out of 10, if there's a dish with "Elvis" in the name, it's going to involve peanut butter and bananas. 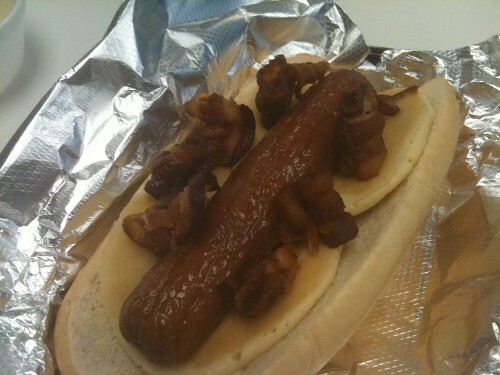 Here's the 10th: the Elvis Dog at Blues City Hot Dog, which opened 3 weeks ago on Highland. From the ground up, the Elvis Dog is a hot dog bun topped with pancakes — pancakes! — then a Nathan's All Beef hot dog, then bacon. 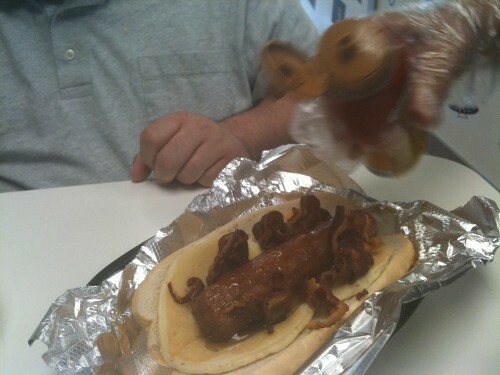 A dousing of the Elvis Dog with syrup is optional. And, yes, of course, we opted for the syrup. It was John Branston who suggested we check out the Office@Uptown Cafe, and since Branston knows best, we did. Part of the business offers "office" resources — a meeting space, access to computers, scanners, copiers, etc. The cafe kitchen is in the back, with seating among those using the office services, with some tables outside. The setup is a little awkward, but nothing that should dissuade those looking for a fine lunch. The menu is compact, offering 10 or so sandwiches or paninis, four salads, and a soup of the day. (Soup/salad or soup/sandwich combos available.) The emphasis here is on ingredients and execution. 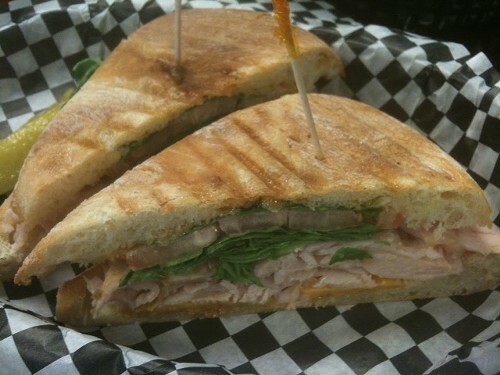 Many of the sandwiches are named after the neighborhood, such as the Uptown Classic ($6.25), a panini with turkey breast, smoked cheddar cheese, fresh spinach, tomatoes, with chipotle mayo. It was declared to be exactly how a turkey sandwich should be. The Bearwater roast beef ($6.95) was much loved. What specifically?, I inquired. The bread, the meat, the cheese went the answer. That pretty much covers that. Paired with the sandwich was a cup of chicken tortilla soup ($2.95). 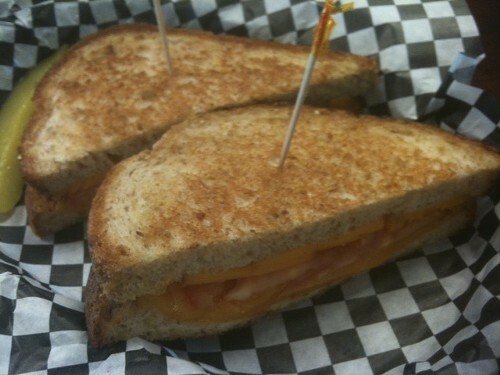 I ordered the Smokey City Melt ($5.25), a grilled cheese with smoked cheddar and choice of bread. It was very good, and I liked large slice of tomato tucked within the slice of cheese. I saved half for later, not always optimal for this sort of sandwich, but this one held up fine. Other sandwiches include the North Memphis BLTA (the "a" is for avocado), the Bluff City Class club, pimento cheese, chicken and tuna salad. They also offer a veggie wrap and a veggie pizza. 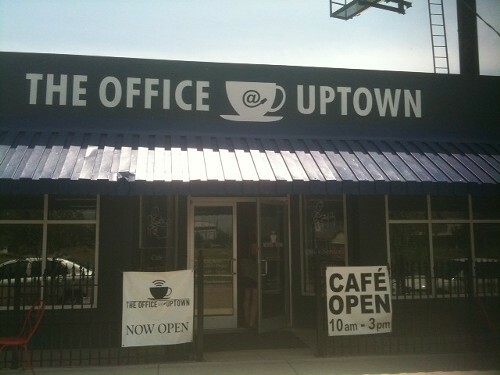 The Office@Uptown Cafe is open 10 a.m. to 3 p.m., Monday through Friday.